EXILE Gallery and Kazuko Miyamoto are pleased to present Container, the artist’s third solo exhibition at the gallery. In 1972, upon relocating from her studio in 117 Hester Street (Lower East Side, New York) combined with the urgency for personal freedom, Miyamoto developed a body of work that was small, modular and mobile; a reflection, perhaps, of her own nomadic situation. Utilizing this energy for producing artwork, she inevitably left traces of these events on objects that so closely resemble minimalist sculpture, yet adhere to her own particular visual language. The center piece of the exhibition is the sculptural installation entitled Hatbox, 1975. Hatbox consists of equal volumes of hexagonal (6) and triangular (36) pieces of gold-painted sheetrock that, in its enclosed state, entirely fill the artist-made and painted box measuring 27 x 50 x 50 cm. In its expanded state, the dimensions of the sculpture depend on the installation by the artist or a person chosen by the artist. 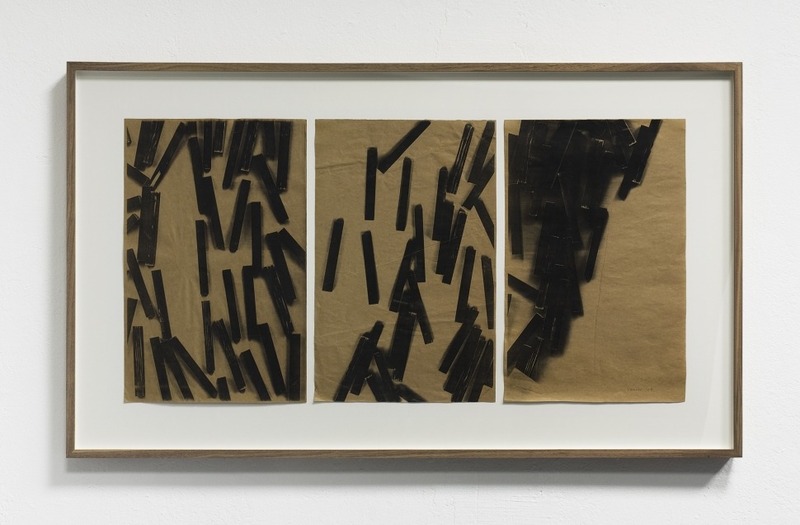 With the same gestural method of “doing and undoing” that can be found in many of her works, such as her string constructions, the process of systematization is both composed and subsequently demolished by the artist’s interaction with the work itself. Container will demonstrate Miyamoto’s playful reinvention of the rules of the minimalist language. In acknowledging the codes that have underlined minimal and conceptual art, she celebrates the spirited nature of chance and the inevitability of imprecision. The materials used keep their organic qualities while simultaneously adopting the familiar expressions of geometry. In doing so, Miyamoto welcomes an open reading and humanness that is so rarely attributed to works of such nature. Concurrently the launch of Kazuko Miyamoto’s artist monograph will take place during the exhibition opening on April 19, 2013. As the first extensive catalog dedicated to her works, this limited edition publication features previously unpublished photographs and documentation as well as texts written by Marilena Bonomo, Luca Cerizza, Janet Passehl and Lawrence Alloway. Kazuko Miyamoto will also participate in the exhibition Conceptual Tendencies II at the Daimler Kunstsammlung Berlin from April 18 to September 22, 2013. She will be exhibiting alongside Leonor Antunes, Wolfgang Berkowski, Klaus Jörres, Sol LeWitt, Brian O’Doherty, Sandra Peters, Stefan Römer, Fred Sandback, Anne Schneider, Uwe H. Seyl and Natalia Stachon. A special section of the exhibition is devoted to Miyamoto and Sol LeWitt. This section will give an insight into the artists’ creative interactions. Amongst other works a string construction entitled Archway to Cellar by Miyamoto last shown at PS1 in 1978 will be shown alongside LeWitt’s only wall drawing made entirely out of string and nails (WD #815) as well as wall drawing #529 last executed by Miyamoto in her community art space, Gallery Onetwentyeight, in New York in 1987.